Before The Rain is the latest release from the Dills. Bridget, LeeAnn, Shawn, and Tim Dill as always provide the vocals on this album, which was produced by Matthew Holt and Donna Beauvais King. Overall: 9 The past few CDs from The Dills have taken a bit of a scaled back approach, going back to their Hymns album from several years ago. The last mainline CD, God Is In Control, was a bit of a step forward from that CD, but still scaled back from the likes of Uncommon or Story Of A Lifetime. With Before The Rain, the group has taken a gigantic leap forward. The group took more time in working on vocal arrangements, and the increased time and work has paid big dividends. The Dills have a bit of a unique vocal lineup in that they have 4 voices, but not a true bass vocal. They’ve worked hard on this CD to make sure that all 4 voices have a part, with quite a few spots of true 4 part harmony. Other spots, Tim typically doubles the top line above him, most often that is Bridget. However, one thing they have done in several spots is allowed the featured vocalist to step out from the background harmonies and take more of a solo approach with block harmonies behind the soloist. Those spots, as well as the true 4 part spots, work out extremely well for the group, and give us a solid indication of the direction that the group is taking vocally. I would have said prior to this release that Story Of A Lifetime was the group’s best project, but I think Before The Rain exceeds even that CD. The primary reason is that the song selection here is very strong, with a consistent theme of real life messages in the lyrics that will meet listeners where they are in the daily lives. I’ve spent a lot of time talking about the vocal arrangements, and they are definitely several notches above what the group has done previously, but more than just for complexity’s sake, the arrangements have served to highlight already strong lyrics, and this is the first CD that firmly cements a unique sound for The Dills and begins to more fully realize the potential that the group possesses. Much like Declaration by the Crist Family, this is the CD that will serve notice to the SG world that The Dills are ready to make some noise in the genre. I think the group has found their musical direction. Tim, Bridget, Shawn, LeeAnn, Matthew, and Donna, congratulations on a job very well done! Jeff Steele is recovering from a serious fall and possible stroke. Be in prayer for Jeff and his family. Gordon Mote is leaving the Gaither Tour as tour pianist. The GVB is currently seeking a new pianist. Mote had the unenviable position of following the late Anthony Burger, who was larger than life as a pianist. Mote did so by carving his own niche and he will be missed on the tour, though he will be appearing on Gaither special events. I’m working on new reviews for the Nelons, Mercy’s Well, and the Dills, so be watching for those coming soon. The Dills have been one of, if not the most, fan-connected groups in the SG industry. They are continuing that connectedness in trying to raise funds for a new album. They have a stated goal of $10,000 and would like to have it raised in the next month. Recording new music and making it available to our friends, fans and supporters is a passion that we take very seriously… but often comes with a huge cost! We’ve never had to borrow money to record a new CD! This is a huge blessing since most independent artists have to take out a loan for thousands of dollars just to record a new project. However, when you add up the cost associated with studio musicians, engineers, producers, duplication, graphic design and mechanical license fees the recording process can easily cost $20,000 or more. Many times we are forced to wait about recording that new CD, simply because the money is not there. As always, we have no intention on borrowing money to make this CD… so that’s where we need YOUR help! I have a lot of respect for ministries that are financially responsible, and especially when they are attempting to take on a large amount of long-term debt. 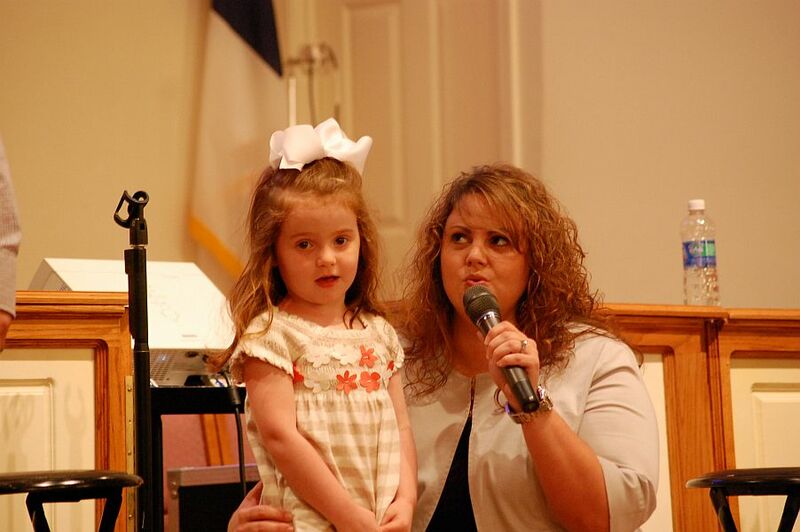 My church built our sanctuary debt-free, and we are currently building a family life center in the same fashion. God has blessed those efforts, and I have no doubts that He will bless the efforts of the Dills to record this album in a financially smart manner. So if you feel led, click here and help them out! 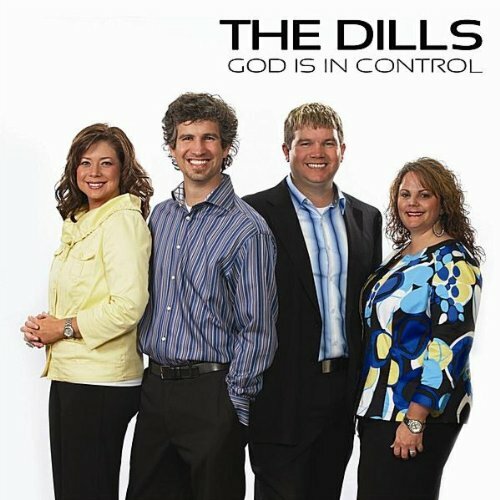 This is the latest release from The Dills. There are a couple of things that make this offering from Shawn, LeeAnn, Tim, and Bridget Dill a bit unique. First, the tracks are done by two people. Matthew Holt played piano on the tracks, and a gentleman named Gene Walden contributed all the other instrumentation. Secondly is the approach to song selection. Only two cuts on the CD are brand new songs. The other cuts are a combination of obscure album cuts, classics, and requests. Overall: 8 The Dills took a bit of a different, experimental approach to this album. They only recorded two new songs, and with the exception of “The Prayer” and “End Of The Beginning”, which they’d had several requests to make available on CD, and “Rise Again”, took the rest of the album to cover songs that would basically sound like new songs to most of their listeners. It’s going to be interesting seeing what the response is to this approach. While this project isn’t quite as strong as Story Of A Lifetime, which I consider to be their best album, they have still succeeded in creating an album that is a very enjoyable listen. “God Is In Control” would make a great followup release to radio. It’s also important to note again that the tracks are the product of two people. Despite this fact, there is no slippage in the quality of these tracks versus their other efforts. Kudos to both Matthew Holt and Gene Walden on producing some superb quality tracks. The Dills, along with producers Matthew Holt, Gene Walden, and Eddie Harrison have produced a high quality CD that will provide some timely messages, solid vocal performances, and a lot of enjoyable listening. Pick yourself up a copy! First of all let me apologize for my absence lately. Between real life commitments and a house full of sick people, including an ambulance ride with my 3 month old daughter (she’s fine now! ), my blogging time has been really hampered lately. However, last Sunday morning my church hosted The Dills during our morning service. This was a bit unusual for us, I can only remember us bringing someone in on Sunday morning one other time. While our church is not used to Sunday morning concerts, it was plainly obvious that the group was right at home in a Sunday morning worship setting. Tim Dill continues to grow and impress as an emcee. He uses the right amount of self deprecating humor along with serious spiritual testimonies. He also keeps the concert moving along, as they did about 15 songs in a little over an hour. Tim has learned how to efficiently manage and maximize their time. Since most of our Sunday morning crowd have not heard them, even though we’ve had them several times, they did a pretty standard set of material, only doing 3 songs or so from their new CD. Those 3, however, seemed to go over really well with the audience. Especially powerful is the title track, “God Is In Control”, which they sing along with the video that they placed on YouTube. The song is very timely, their performance excellent, and the message poignant. 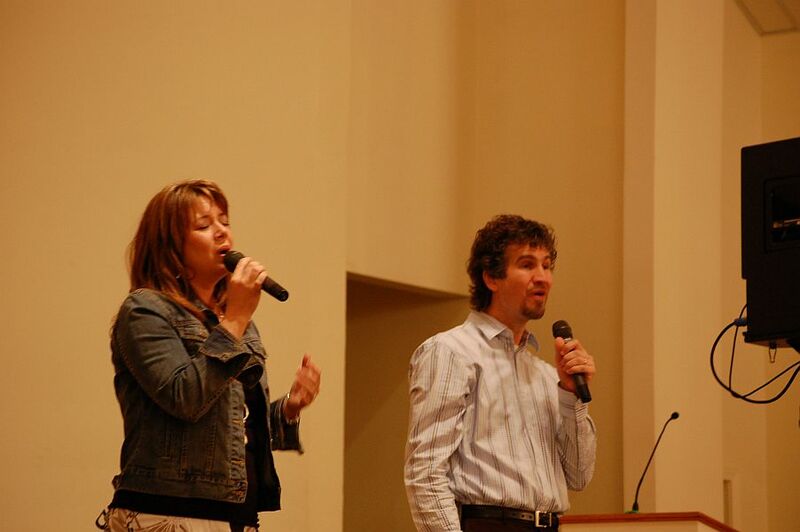 I’ve always liked their versions of the worship songs “Lord I Lift Your Name On High” and “Days Of Elijah” as well. 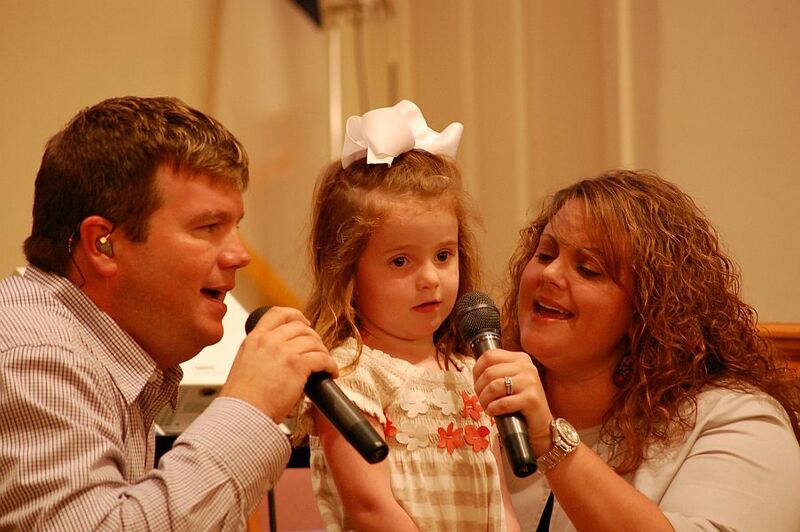 When the group sang their current single, “Rise Again”, they did something very special for me, as a proud daddy. I had mentioned to Tim and LeeAnn when they were setting up the night before that “Rise Again” had become my 4 year old daughter’s favorite song. 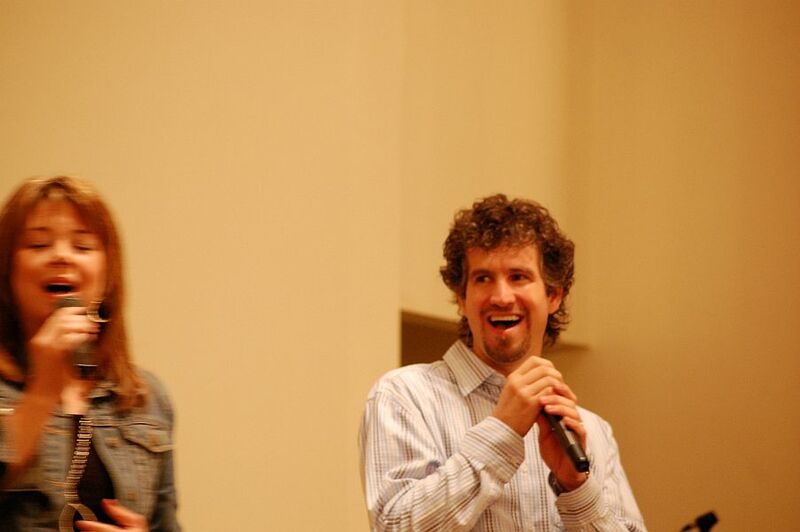 When they were doing soundcheck, they let Erica come up and sing it with them. 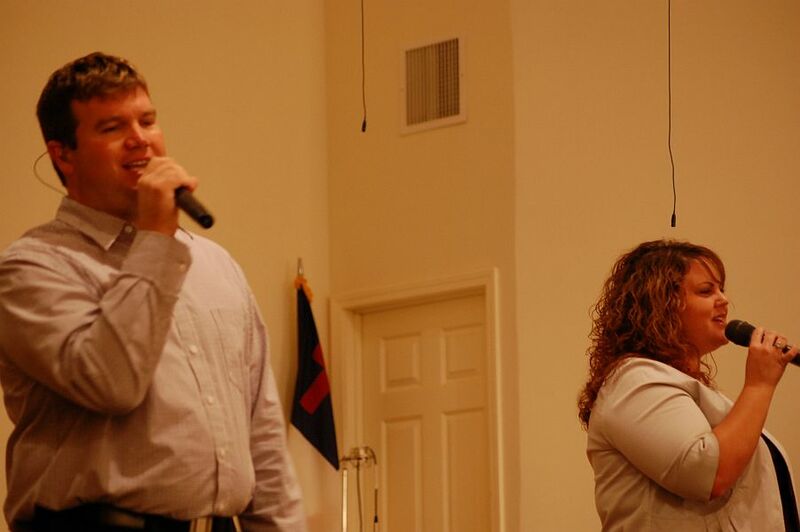 When they came to this song during the service, Tim asked Erica if she’d like to come sing it with them, so she made a mad dash to the stage. Needless to say, I was about to bust, and thanks guys for giving her an absolute thrill. The next four songs of the set are four of the strongest songs that the group sings. Marcy Kelcey’s classic “Oh, What A Beautiful City” is obviously a fan favorite of the group, as I don’t think I’ve ever seen them not sing it, and it never fails to elicit a great audience response. Bridget took the lead on “Shout To The Lord” with Shawn providing the only accompaniment on piano. I’ve always said that “Uncommon” and “Jesus Never Fails” back to back make the best lead in to an altar call I’ve seen, and I still maintain that position. 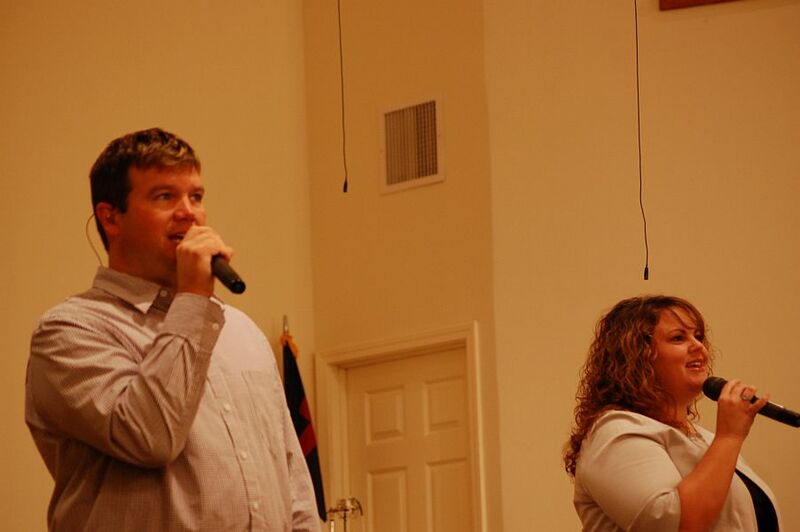 The group sang “Jesus Loves Me” while giving an invitation at the end of the service. 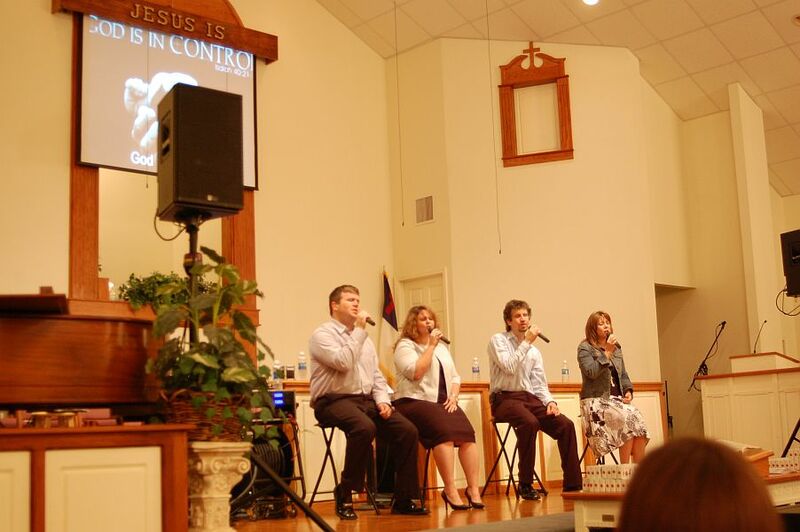 It’s clear that the Dills are very comfortable in both a true concert and worship service setting. They are very good at reading the mood of the service/concert, and gearing their song selection to that mood. Their performances are very solid, their song selection is good, and their attitude and spirits are warm and genuine. 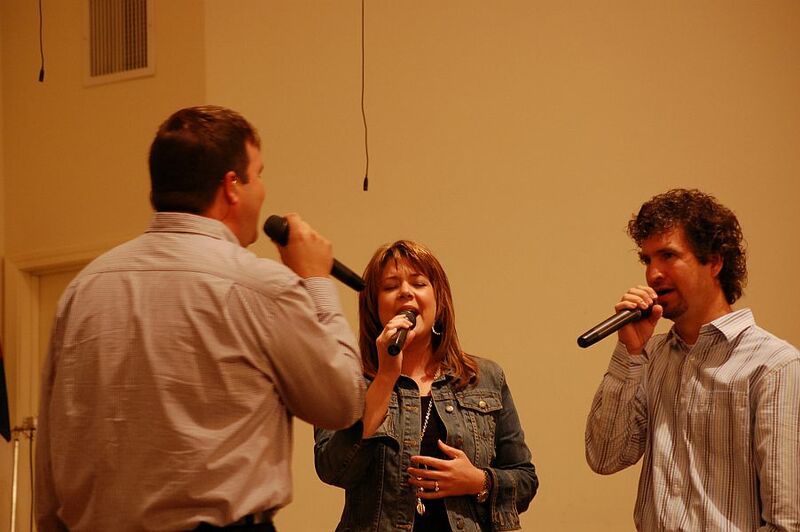 If you have a chance to catch them, either in a concert or in a worship service, do yourself a favor and go. You will come away entertained, refreshed, recharged, and incredibly blessed! The Dills have issued a viral challenge. They have uploaded a video set to the title track of their new CD, “God Is In Control”, and are trying to get 1 million views of the video. Watch it and pass it along. I’ll say more about the song in my review of the CD, which is next on my list! Suffice to say it has a great message that is accentuated by the video.